Ian Chesterton (played by William Russell) and Barbara Wright (played by Jacqueline Hill) were two teachers who taught the Doctor’s grand-daughter Susan at Coalhill school. They unwittling become the first non-family companions to be featured in Doctor Who. In the original pilot An Unearthly Child – 1963, Ian was a science teacher and Barbara – a History teacher. Together, they noticed how unusually bright a shared pupil of there’s were – Susan Foreman. (they did not know she was an alien at this point!). But how she struggled with some basic concepts, such as currency. Curious about her past and concerned for her welfare, they followed her home one night after school to I.M Foreman’s Junkyard where they met her next of kin – The Doctor. The Doctor and Susan, explained their origin to the two startled teachers and then promptly kidnapped them both, going on a journey through space-and-time to Earth’s primitive past. Ian was to “go on the journey ” the most, out of the three companions. In the days when female characters wete purposely left underdeveloped. He was smart, headstrong and brash and fiercely protective over Barbara & Susan. At first, he (and Barbara) clashed with the Doctor in The Edge of Destruction but eventually they both won the Doctor’s stubborn respect. Later on, Ian was to watch out for the Doctor on many occaisons saving his neck – physically, his army training put to good use. Ian was also to develop some nifty sword skills along the way (The Aztecs – 1964 & The Crusades – 1964). He also displayed abilities to organise and lead others, such as when he was made to challenge to become leader of the Aztecs in The Aztecs – 1964 or whipping up the Thals to attack the Daleks – in The Daleks. Ian also overcame his fear of drowning in (The Romans – 1965) when he was sold into slavery and the galleon he was aboard sank, forcing him to swim for it. He even gained his sea legs, aboard the Marie Celeste in The Crusade – 1965. Barbara and Ian were the moral compass of the group, frequently clashing with the Doctor over his sometimes inhuman and standoffish ways. 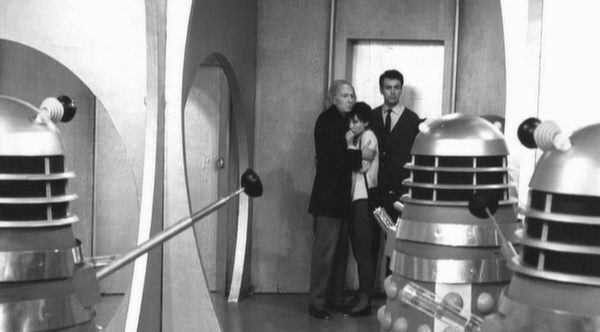 In The Daleks – 1964, Ian castigated the Doctor over the suggestion that the Thal’s should mount a suicide assualt against the Dalek city to retrieve an integral component lost from the Tardis. Barbara’s knowledge as an Earth history teacher, was to serve the Doctor well on their travels. She was able to advise the Doctor on the custom and practice of different historical cultures, including how to blend in to the local populace; so as not to cause suspicion, as inThe Romans – 1965 & The Aztecs – 1964. Barbara had a particular interest in the Aztec culture but was soon party to the horror of human sacrifice, when they visited the time period in The Aztec’s – 1964. Barbara was mistaken for a reincarnated deity and using her standing, tried to make the Aztec’s change their savage ways – by appealing to their better nature but it was too ingrained in their culture. Barbara most important role in The Tardis was to look after the young and impressionable Susan, with whom Barbara developed a motherly bond. Susan had a brilliant intellect but was profoundly naive and Barbara attempted to protect her from the worst dangers. Barbara was particularly sad when Susan left but was rather indifferent to her replacement : Vicki, in The Rescue – 1964. Despite Ian & Barbara’s eventual enjoyment of their kidnap predicament, they both decided to stow away aboard a Dalek Time Ship in The Chase – 1965, returning to 1960’s London, 2 years after they left, leaving the Doctor for good.